To generate a story, all you'll need to do is click the "generate" button. If you want to know how this works, it uses a "context free grammar" to generate its stories. Look around in the grammar.txt file if you're interested in seeing what it looks like! Nice work! 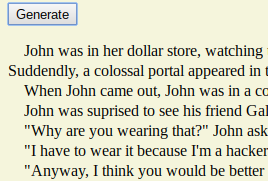 The stories seem to make more sense relative to other story generators. Interesting... the topic changes quickly over the story like a Simpsons' episode, but locally it remains consistent. 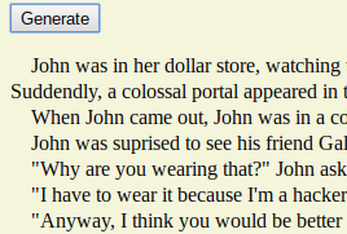 Sentences are more complex that what I saw in other story generators, some would even say they are stylized. Where can I find the grammar.txt you're mentioning in the description? I wonder if there is a gender check btw. I had a female clown ("she woke up in her prison") who turned into a male dragon ("him"). Gender gets assigned randomly. “Him” shouldn’t be there, that’s my mistake. As for the grammar.txt, it’s in the source files. I guess you could find it in the “network” tab of inspect element? Let me know if you still need help. "My name is Trump, and I'm the most magical bank robber in the universe!" the bank robber said. I almost dropped of my chair ! I’ve never gotten that one before. Interesting. Yes, but it doesn't seem to work. You can try enabling reader view, or pinch to zoom out.